In 1916, Anderson met Jane Heap, with whom she had a productive business partnership and an intense love affair. They lived and worked together on the Little Review until 1923. The same year, Anderson's sister, Lois, was hospitalized for a nervous breakdown. Anderson and Heap took custody of Lois's two sons, Fritz and Tom. Although they were Anderson's nephews, Heap became responsible for the boys' upbringing. In January 1924 the two women went to a lecture by A. R. Orage, who had been sent to spread word of the teaching. Meeting Gurdjieff later, Anderson decided to go to his Institute in France, taking with her the diva Georgette Leblanc, her new love, while Heap followed later with the two boys. Anderson and Leblanc lived first near the Prieuré, and then in Paris when the Institute closed. Later they moved to Normandy, then to Le Cannet, near Cannes, where Leblanc died in 1941 after a long illness. The following year Anderson left for New York. On this voyage, she met Dorothy Caruso, widow of the famed tenor. 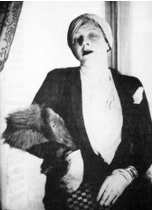 The two women began a relationship that lasted until Caruso's death in 1955. Anderson returned to Le Cannet, where she continued to write and edit until her death from emphysema on October 19, 1973. Meeting Orage in 1924 was a turning point for Anderson. Overwhelmed with pressures from her work and relationships, she, like her sister, suffered a nervous breakdown and was deeply depressed. By questioning Orage about the teaching, Anderson said she "had learned that this doctrine would not fulfill our hopes, it would exceed them. "5 However, shortly after the women's arrival in France, that June Gurdjieff was seriously injured in an automobile accident. After his recovery, his focus changed from the teaching of students to the writing of his legomonism.6 Gurdjieff closed the Institute that August and took over the group now consisting of Anderson and Leblanc, along with Elizabeth Gordon, Solita Solano, Kathryn Hulme, Louise Davidson, and Alice Rohrer. It was called the Rope.7 Gurdjieff often met with them daily, sharing meals, reading his writings, and answering questions.8 Anderson worked with Gurdjieff in this way until the coming of the war and Georgette's illness took them out of Paris. Anderson later returned to Paris in 1948 with Dorothy Caruso and worked with Gurdjieff again until his death on October 29, 1949. "Everything is a mystery, and everything is a paradox. To understand this takes more than human comprehension, and more than human comprehension means: to know. 1. William Patrick Patterson, Ladies of the Rope (Fairfax, CA: Arete Communications, 1999), 19–22. 2. Margaret Anderson, My Thirty Years War (New York: Horizon Press, 1951), 35. 5. Margaret Anderson, The Unknowable Gurdjieff (New York: Arkana, 1991), 110. 6. Sophia Wellbeloved, Gurdjieff: The Key Concepts. (New York: Routledge, 2003), 245. 9. Anderson, The Unknowable Gurdjieff, 111.